Learn all about storing, protecting, selling, and delivering downloads to your customers using the PayLoadz system. Do you sell digital products online or are you considering starting to? Digital products include everything from software, eBooks, manuals, articles, certificates, files, and forms to music, movies, digital art, photographs and just about anything else that can be downloaded and delivered to your customers! PayLoadz offers a number of services for secure download delivery and download storage. If you want to have a successful download delivery business, read on to learn more. The automated PayLoadz service allows for sending downloads easily and quickly without any hassle. In fact, it makes it possible to send download files to your customers instantly once payment is received via PayPal or Google Checkout. Up until that moment, we protect downloads in our system. Once you join PayLoadz to deliver downloads you may see exponential increase in your overall sales! So, what are the benefits of using PayLoadz for delivering downloads? First of all, secure download storage. In addition to securing downloads for members, PayLoadz also offers automatic delivery of those digital products which means your customers don’t have to wait for their purchase. Additionally, PayLoadz doesn't have to be your only venue of sale – you can sell your downloads via our Store, eBay, your own site, or just about any other location and deliver downloads through PayLoadz! Wondering what kinds of file types PayLoadz can support when delivering downloads? The answer is simple – just about anything. Whether you are selling a personally authored ebook, software, photographs, art, games, movies, or music, we support all file types. As long as the file can be downloaded by your customers, you can sell it easily and securely. Any file type can be a secure protected download including but not limited to .pdf, .exe, .zip, .jpg, .mp3, .sit, .wmv, and so on. Documents, knitting patterns, music, manuals, anything that is digital can be send automatically over the Internet. When you are in the business of selling digital products, securing downloads and protecting downloads is a main concern. It is essential that all files be protected and secure. With the PayLoadz platform, there is nothing to worry about. Our system focuses on securing download files for both our members and their customers. As a PayLoadz member you can store your downloadable products in our protected system. What this means is that your files can only be accessed through special links either by you or your confirmed customers. Customers receive links once payment is received, so there is no risk of delivering downloads to the wrong recipient. Sellers may deliver their downloads through these specially generated links, as email attachments, or refer customers to the PayLoadz Order Lookup System which allows buyers to find their files on their own (with the use of special key codes). It is worth mentioning that the PayLoadz system actually tracks download deliveries by individual transactions. Each link generated for a particular sale expires after a pre-determined period of time. As added protection in securing downloads, these links also have limited clicks allowed and IP address monitoring as well. This protects the seller from excessive downloading of the file and losing out on sales. 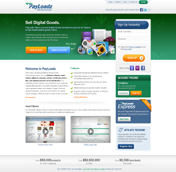 PayLoadz protects downloads for you. Download delivery has never been easier or more secure than with the PayLoadz system. This means that selling downloads online just got a whole lot more convenient for sellers all over the world. It doesn't matter where in the world you are or where in the world your customers are, with PayLoadz you can rest assured that your downloads will be secure and the selling (and buying) process as easy as possible. We create a PayPal Secure Downloads platform using their payment system and our delivery mechanism. Remember, because our system is so dynamic and versatile you can use it anywhere to sell your downloads online. We make it possible to use the URL our system creates to feature on your own website, blog, or e-storefront. This URL could also be used on social networking sites like Facebook and MySpace. Additionally, the PayLoadz Store allows for a venue where you can feature your secure downloads with confidence. Delivering downloads to customers requires that you think about the various delivery methods that are available. First and foremost, you should make delivering downloads as easy and automated as possible. This will only translate to more sales. Secondly, you need to consider security. Secure downloads are essential – customers worry about viruses and fraudulent products while sellers must consider theft. With the PayLoadz system, you get the best of both worlds. Securing downloads and automated delivery are two of our best features. Our system is extremely reliable and has an excellent delivery rate. We assure you that you'll be a satisfied and profitable seller while your customers will have no complaints. We've worked for years to perfect the technique of selling and delivering downloads online. The PayLoadz digital delivery and download protection system has evolved into a powerful file and delivery service. We are the original download service provider operating on the PayPal payments platform and have received numerous accolades for the services we provide. Sign up today for a free PayLoadz account and secure your downloads instantly.